Over the past decade, the number of individuals doing business online and using various forms of e-payments has seen an incredible increase. At the same time, the number of people who are participating in online gaming has grown. While security and safety measures are commonplace for most online businesses, the online gaming community does not enjoy the same standardized online identity verification and authentication tools. An additional challenge is that each country hosting an online gaming operator will have its own local rules. Because of this, gambling and gaming sites are left to their own devices in order to authenticate their customers. Standard methods of protecting individuals are needed. As the technology involved in the Internet gaming industry evolves, the methods of committing fraud evolve as well. Simple credit card theft is not the only crime to watch for and prepare against. Identity theft and misrepresentation are other means of fraud. Gaming providers have been forced to adapt their privacy and protection to reach a wider audience and to combat a more tech savvy brand of criminal. They have gong great lengths to ensure that your gaming experiences are safe and secure. As online gaming grows more popular, the risks associated with playing increase and good security becomes even more vital. One way in which gaming sites will protect their players is with SSL (Secure Sockets Layer) 128-bit encryption technology. This ensures your payments will remain safe despite the best attempts of any hackers to intercept your credit card information or your payment. SSL encrypts all incoming and outgoing transactions – including personal and bank card information. Your credit card companies use this same technology. If it works for credit giants MasterCard and Visa, it works for our favourite online gaming site. 128-bit encryption is an added bonus where the encryption key used changes for each transaction between the casinos and financial institutions or players. Because of this, hackers will find an additional challenge in decoding the information. When you decide to game online, you want a site you can trust. Finding an operator with a proven track record in security is key. The most reputable sites are licensed by legal gaming jurisdictions around the world, such as Gibraltar or Malta, and maintain rigid fair gaming requirements. The gaming stipulations include the very best documented Random Number Generators and security features in place to ensure issue-free payments. All of these precautions will have been in place before they accepted their first deposit or ran their first game. This information is easy will be posted on the casino's home page. They'll proudly display the logos of independent auditors used to oversee their software. With any luck you'll see a couple of e-Gaming awards. There are other steps to take in order to ensure the security precautions offered by the site you're considering are to the level that you expect. To begin, ensure the casino has a good reputation. Read the reviews they have posted online, as well as unrelated sites whose job it is to review online casinos. Investigate if the casino has complaints filed against them. Review their payment policies and schedules. It is your responsibility and in your best interest to find this information before you invest time or money with this operator. After a problem arises is too late to question. Next, review all of the casino's posted policies. Consider if their posted statement is hard to find or difficult to understand. If the policy doesn't address all of your questions, email the site administrator and note how quickly and how completely he/she responds to you. Ensure your private information will remain private and that they don't intend to expose it to other companies. If this information isn't readily available, email to check. Not only will this save you unwanted spam, it go great lengths towards protecting your identity. Also, take care to be aware of how the casino accepts payments. Ensure the server is secured and that other precautions are in place to protect you during transactions. If you do not feel completely safe, find another online poker room. Once you have confirmed the safety measures of the casino and have decided to play your first games, you want to be sure the software is set up for fair practices. You don't want to take a seat at a home poker game if there is any chance the dealer isn't playing fair and you should expect the same consideration in an online game. There has been a lot of vocal concern about the frequency of bad beats in Internet games. There are several reasons why this can appear true. Online casinos use pseudorandom number generators (PRNGs) to produce pseudorandom numbers (PRNs) that work like a random hand deal or roll of the dice. Each hand of poker moves faster in an online game, so the frequency of these odd hands and bad beats will seem greater, so many experts believe this is a false impression. Other experts believe because of the intended random nature of rolls and deals, the online hands are actually more realistically random than games relying on human dealers. PRNGs should be tested completely to ensure that no behaviour can be predicted. They are built in such a way that their output is determined by their initial algorithm. If you have that information, you can determine every output the PRNGs will generate. For this reason, in order to assure fair play in the game, online gambling casinos must use state-of-the-art PRNGs and they must keep the originating algorithm under wraps. Once those two factors are assured, the casino needs to address the manner that the PRNGs turn PRNs into hands of poker or rolls of dice (the transformation method). If this method is not working as it should, hands of cards won't appear random and some cards will appear more frequently. Avoiding bias is required for a fair game, so even after the algorithms and transformation methods are chosen and confirmed to be the best they can be, they must be implemented correctly. It is important to remember that hackers and criminals are both determined and crafty. They will research the casino's PRNG to try and predict how cards will be dealt. For this reason online gaming sites will re-evaluate and adjust their PRNGs regularly. One recommendation is for gaming sites to take this proactive measure twice a year. The operators must stay ahead of the attempts to figure out their system. For that reason the Internet operators require a strong and competent system administrator that is dedicated to fair play. The administrator must attend to the algorithms, the programmes, and the transformation. Keeping information safe from hackers isn't the sole concern for privacy and fairness. The administrators must also ensure a fellow employee cannot gain access to information or systems that they should not be able to breach. It requires a secure technique from the very beginning, from initialization through all testing and implementation to ensure fair play. Despite the best attempts of fairness and safety, you may find yourself in a position where you suspect fraud. Knowing how to handle this issue is an important part of being prepared and feeling safe online. You'll also want to contact your bank or credit card company at first suspicion if you have shared account numbers on the questionable site. Alerting them as soon as you suspect a problem will protect you more than waiting. In the instance that you're receiving fraudulent or scam emails, you can contact the provider of the email account. If contacting a service provider, be sure to copy the email and all of its headers and include this information in the email you are sending to report the problem. With this information, they can better trace the source of the scam. If you suspect fraud, you'll want to involve all levels of law enforcement. Reporting e-crime is just like reporting an in-person crime. Once determining if the situation is an emergency, proceed from there. If there is an emergency, call 111 and request the police. If this is not an emergency, phone the local police station for criminal matters. Gaming offences should be reported to the Department of Internal Affairs and other online offences should be reported on the NetSafe – The Orb website. Keep all of the evidence you can. Save screen shots and email. Collect information from your IT administrator. Phone free 0800 VICTIM (0800 842846) for assistance, support, and information for victims of crime and trauma. If all of this sounds a bit ominous, it isn't as bad as all of this if you keep yourself aware. Legitimate online gambling sites are thoroughly dedicated to providing you a safe and secure gaming experience. They spend millions of dollars on development of their software and security measures to keep players' information and transactions secure. They utilize top-rated randomizers and security algorithms, in addition to using the top-rated and most secure deposit methods. But, the concern for security is real. This is the reason that we, at OnlinePoker.co.nz have presented and recommended the top kiwi-friendly online poker rooms. 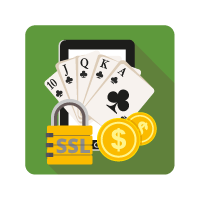 If you stick to these well established, well tested, and highly respected sites, you can rest easy that your online poker play will be free from security concerns. But even in the best of situations and on the best sites, keeping yourself safe online is a priority for you and for the sites where you game. If the privacy of individual gamers isn't protected, it will have a negative impact on the reputation of the site. The sites will do their part to keep you safe. But, you owe it to yourself to be aware of what precautions the site has in place to ensure fair play and secure privacy before you enter your credit card number into their secure system. Knowing what they should have done to protect you gives you a clear view of what to watch for. If anything doesn't measure up, walk away. You will find another site that meets your expectations. Should you be the victim of fraud, knowing what steps to take after the fact will minimize the damage. You can find a link to the top New Zealand online poker sites here. [xxxx] Read our reviews, take a tour, and find the online poker room that is the best fit for you. And make sure you come back to OnlinePoker.co.nz for the latest in news from the online poker front. We will give you the latest news and information about online poker security and safety as well as meeting your other poker information needs.